Representatives from four area organizations gathered at College of the Ozarks last week to discuss what they see as issues facing those in poverty in Stone and Taney counties, what the various groups are doing about it, and where they see the issue of poverty heading in the area. Their discussion was part of the Truett Cathy Poverty Summit at College of the Ozarks. 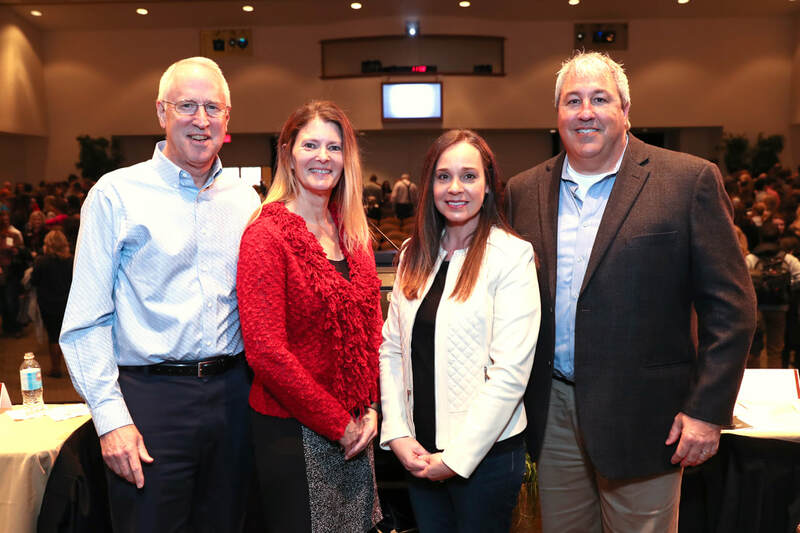 Pictured above, from left to right, are John Baltes, president of the Silver Dollar City Foundation; Dr. Chris Johnson, superintendent of Crane R-III schools; Elizabeth Hughes, executive director of Christian Action Ministries; and Bryan Stallings, CEO of Jesus was Homeless. Photo credit Kevin White. More than 400 people attended the S. Truett Cathy Poverty Summit on Friday, February 1, at the Keeter Center at College of the Ozarks. These attendees represented a number of business and charity groups that are focused on alleviating poverty in Stone and Taney Counties. Dr. Chris Johnson, superintendent of Crane R-III school district, was one of four peoeple selected to answer three questions about poverty in the area: what the groups see, what they are doing about it, and where do they see the issue going in the future. Dr. Johnson said that at the school, they are primarily seeing the impact of generational poverty playing out in a number of ways. She highlighted the impact of poverty on the health and attitudes of students in the school. “We often see health issues in these homes, either they don’t go to the doctor at all, or they only use the ER. They also seldom go to the dentist,” she said in her portion of the discussion. She also spoke of an entitlement attitude in the students, which she partially identified as an issue with the generational poverty. Generational poverty is where students who grow up impoverished tend to remain so when they are adults. Troublingly, Johnson said that many of the most at risk children know the system inside and out. “Even when we are almost positive there is abuse or neglect, the kids know that mom or dad don’t want strangers in their house, so they won’t report it,” she said. “Some of these students exhibit an attitude of entitlement, where they think they should not have to work for things; that they just deserve them,” she said. Crane School District is undertaking a number of initiatives to counter these trends, however. Johnson also spoke about a new service coming into the school. “We are going to have Burrell [Behavioral Health] bring someone to the school so kids who need those services can get them without a parent needing to take time away from work to take them,” she said. The work of various churches in Crane was also emphasized in the talk. Johnson talked about the recently created Never Be Alone time at First Baptist, along with a life skills class that another area church puts on. “We are at the edge of a cliff with poverty, but we are working as a community to show the love and care,” she said.